superdumb supervillain: Are You a K'NEXpert? K’NEX is launching its annual building contest, the 2009 K’NEXpert Search! Three lucky builders (one from each age group: 5-6, 7-8, 9-12) will each receive $10,000 savings bonds for college and seven others will each receive $1000 for college. In addition, all ten major prize winners will receive $500 worth of K’NEX Building Sets, a trip for three to New York City for the 2009 K’NEXpert Award Ceremony and their own photo gallery page on the K’NEX website. All semi-finalists and finalists will receive discounts on online purchases for a year, K’NEX gear, a K’NEX birthday gift, , and an invitation to visit the K’NEX headquarters and discover, through company designers, how K’NEX is made. The 2009 K’NEXpert Search will run from now through September 30, 2008 with winners announced on or about October 28, 2008. 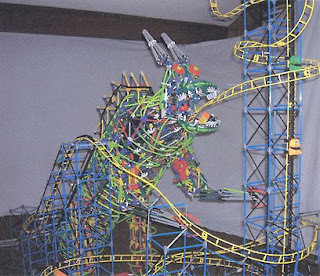 Children between the ages of 5-12 may enter by printing out the entry form from the K’NEX web site and mailing it in. Submissions must include a photo of the creation and a one-minute video or one-page summary describing how the child came up with the idea, how long the design took to build and how many K’NEX pieces were used. The entry must fall within one of four building categories: Ultimate K’NEX Model; Futuristic; Vehicles; and Amusement Park Thrill Rides. Kids are encouraged to let their imaginations run wild – models are judged on creativity, uniqueness and detail. A panel of judges comprised of K’NEX employees will select semi-finalists; an online vote will determine ten winners and Joel Glickman, inventor of K’NEX, will choose the three Grand Prize Winners. Last year's grand prize K’NEXpert winner was 10 year old Ian with his amazing "Belly of the Beast!" You have to see it in action to fully appreciate how cool it is! I remember those! They are awesome.